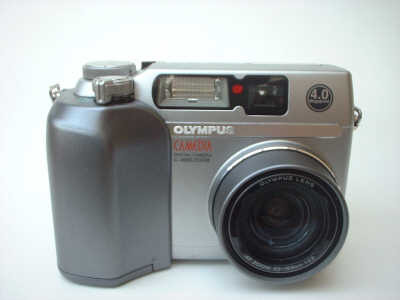 I chose the Olympus C400 Zoom for several reasons. * It had a good resolution 4 mega pixels, there are cameras with a much higher resolution but since most of my images were for this web site, the resolution was high enough to allow me to crop images without reducing quality significantly. * It allowed fully manual exposure as well as aperture and shutter priority and program mode although I am now finding (about 1 month on) that I am using program mode most of the time, whether this will continue to be the case only time will tell. * It took standard AA batteries which meant that I could buy several relatively cheep sets of nickel metal hydride (rechargeable) batteries which would give me good battery life (about 70-80) exposures with flash! Also if I was ever in a situation that I could not recharge the batteries at least I could buy disposable alkaline batteries and use them. * The smart media card matched a camera I already had. * The smart media means that you can use the camera as a disk drive. You can copy any file (picture, word document or anything else that will go on a windows PC) back onto the camera. This is great for transporting files from place to place or for creating a slide show, simply edit the pictures on the PC and copy them back onto the camera, take your camera to the presentation and plug it into the projector or television. * The camera had good auto focus, and close focusing range. * It represented good value for money especially as I was limited as to where I could purchase the camera because of an insurance credit note. * It is quite bulky, its not something you can put in a stab jacket and take with you just in case! 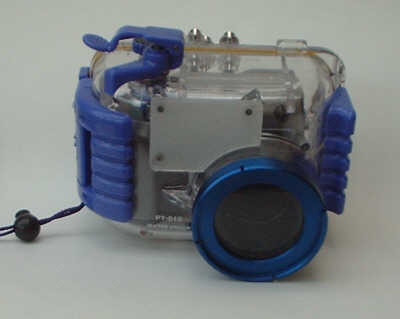 * The Olympus housing has a depth limitation of 30m, this is fine for most of my diving but obviously I can't take any photos on deeper dives, I must rely on other peoples images or use images from shallower depths that are representative of the actual dive. * As with all other compact cameras without an external flash the flash is very close to the lens which means a problem with back scatter. I've used the camera in visibilities from about 4m to 15m+ and have had very good results up to about 0.6m, above this back scatter is a serious problem even in the 15m vis. Would I recommend this set up? Without a doubt! Its effortless, just point and shoot, take upto 80 photos on a dive delete the ones that don't come out, use the ones that do. Yes, get it insured! I dived on the Citrine a shortly after getting my camera and a chap came up from his first dive with his, only for the case to pop open and the camera to drop out and disappear into the blue! Best results will be close up, back scatter will be a problem with the inbuilt flash at greater distance.